As you are planning for your winter activities, riding your motorcycle is probably not one of the items on the list. In fact, if you are like most other riders, you will probably put it in storage for the entire season. And this is because there is a common misconception that biking is not a winter thing, but the fact is that you can ride your motorcycle throughout the year and in any season. For winter, you only need to make sure your bike has appropriate winter tires and other important components to suit the season, and that you dress appropriately. 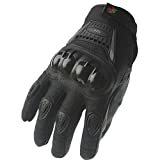 When it comes to wearing proper winter clothes for riding motorcycles, gloves are one of the key things you need to buy. And because we know the many options in the market can be a little confusing, we review 10 of the best ones from different brands to help make your choice easy. ILM makes this glove with three key things in mind which are the comfort, safety, and warmth. For maximum comfort, it is available in various size options to make it easy to get the perfect fit, and with a Velcro closure for a custom fit. When it comes to safety, it uses a large U-shape protection for the back that helps to ensure that its arch-shape fits the hand well. This ergonomically engineered glove also has some additional protection for the joints, and it is completely water and windproof, and with a soft and warm interior. 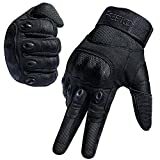 A good winter motorcycle glove is one that is able to keep your hands warm and cozy when out in the freezing cold. This glove does this and it uses a deluxe poly-filled lining insulation to help keep the hands warm. And its fully-leather material also helps with the warmth and to make it weatherproof. The glove also has a fully adjustable Velcro closure that helps to customize the fit, and when you compare it to many others in the market, it is relatively more affordable. This glove is also available in different sizes to suit both men and women. You can always trust any genuine leather glove to serve you well as this is one of the best materials for making gloves. This particular one uses real leather which helps to make it weatherproof, and it also has a durable double stitching design to make it more long-lasting. The glove uses a Velcro strap and elastic band to ensure that you always get a custom fit, and it is available in various sizes with a unisex fit to work for both ladies and men. Also, it has adequate padding around the knuckles to keep them safe. This leather glove might not have the traditional armor design for the joints and knuckles but it makes up for this by being super comfortable. The leather is soft and easy to break-in, and it combines with the nice lining to make this glove both warm and comfortable. Also, it is available in five different sizes to ensure every man can get something to suit his needs. And it has a Velcro wrist closure for a snug and custom fit, and it will be protective and cozy even when the temperatures are super low. For most rides, how a glove looks is almost as important as how protective it is. And so the fact that this one comes in a sleek and stylish design means that it will impress most riders. Besides the fantastic look, it is also a tough and highly durable glove thanks to the 100% drum-dyed cowhide leather construction. The manufacturer uses pre-curved fingers on the glove to help improve the fit, and it also has integrated buckle armor for extra protection. Also, this is a great glove for wearing at night as it has a reflective piping to provide extra safety by increasing visibility. If you are planning to ride your bike when winter is at its coldest temperatures, you will be happy to have this glove. And this is because it uses 100G of Thinsulate insulation to ensure that your hands remain warm and cozy even in the most extreme temperatures. This glove is also made with a wind and waterproof shell to help keep the interior dry and with a slip-resistant palm for extra safety as it will not slip out on the handlebars. Other things like the finger gussets help to enhance flexibility while the adequately padded knuckles provide extra protection. 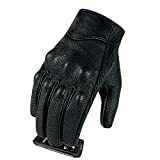 Here is another pair of genuine leather gloves that will not only last for a long time but also feel warm, cozy and comfortable which is just what you need in winter motorcycle glove. They have an adjustable wrist closure and a zipper which combine to ensure that you always get the best fit possible. They are also designed with extra finger protection and will remain flexible even in the coldest temperatures. These gloves are both wind and waterproof, and so you can be sure that your hands will remain dry. 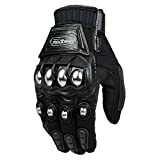 Like with all other motorcycle products, you will always get what you pay for when buying gloves. And so the fact that this one costs more than the average ones should be a good indication that it is top notch quality. It is made from supple drum-dyed cowhide leather that will last for a long time, and it comes in a pre-curved rider-friendly design. This glove also has leather reinforcements throughout and high-density knuckle armor for more protection. 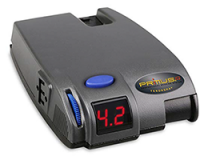 And it has vibration dissipating palm gel for extra comfort, and secure hook and loop closure. This glove is designed to suit the needs of a female rider, and it is made with genuine goatskin leather for maximum durability. 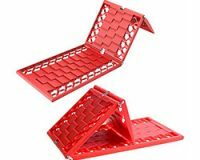 Also, it is perforated for enhanced breathability and it has some hard plastic knuckles and foam padding on the finger for extra protection. You do not have to remove the glove to use your phone as it has a touch screen capable index finger that can be very convenient. 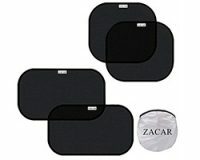 It has a soft and flexible overall construction to enhance comfort and is available in different sizes and colors. Qingdao Kaiwende Industrial Co., Ltd. The sleek and appealing rustic look is what will draw many riders to this glove. It is a durable and supple glove made from goatskin leather and with perforations for enhanced ventilation. This glove also has some padded knuckles for extra protection, light palm padding and reinforced thumbs and index fingers. Also, it has a pre-curved design for maximum comfort and improved dexterity to minimize hand fatigue. Winter motorcycle gloves make riding in the cold temperatures more comfortable and safer. And you do not have to waste a lot of your time shopping for them because any one of the ten above will be perfect for you. Just pick one that you find most appealing, and you will be ready to hit the road. If you have already used one and would like to share your experiences, drop us a comment below.